Arsenal lead the Italians 2-0 after an impressive performance at The Emirates, but the job is far from done. 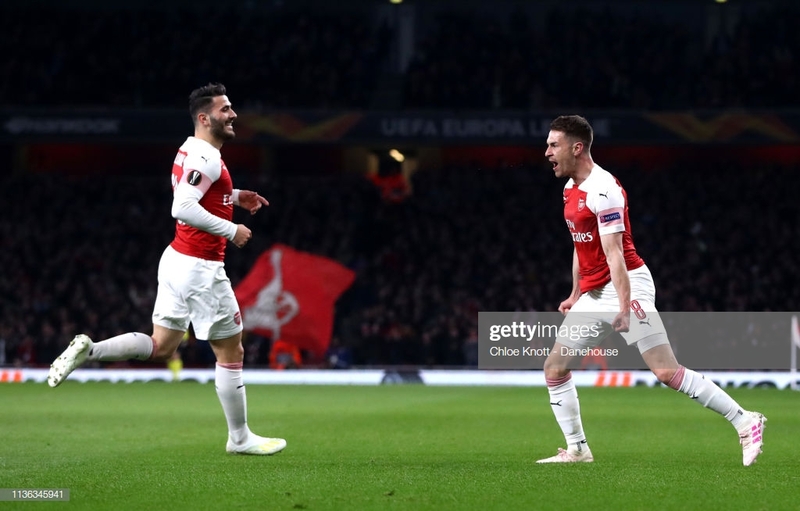 Aaron Ramsey is confident Arsenal can get the job done in Naples next week despite their recent away woes after a 2-0 first-leg victory in their Europa League quarter-final. Ramsey opened the scoring on 14 minutes before Lucas Torreira's deflected strike put Arsenal in control. Though they will be relieved to keep a clean sheet, they may regret missing opportunities to extend their advantage - Ramsey and Pierre-Emerick Aubameyang both squandered good chances. Overall, the Welshman was very satisfied with the result, admitting his team had to 'suffer' at times given the quality of the opponent. "To keep a clean sheet and score a couple of goals was a lovely place to start the first leg, so we’re delighted with that," he told arsenal.com. "We suffered a lot - they’re a very good team and we had to dig in tonight. It’s a great start to the quarter-final. "Of course [we could have scored more]. I should have scored in the second half, but these things happen sometimes. We’re delighted that we kept a clean sheet and scored a couple of goals. We go into the second leg with that bit of a cushion, but we know from past experience that it’s a difficult place to go." Ramsey is under no illusions as to the task that faces Arsenal in a week's time. There were warning signs for Arsenal even in victory, with Lorenzo Insigne and Piotr Zielinski going close. Moreover, Napoli have only lost once at home all season - against Juventus last month - and deservedly beat Arsenal's Premier League rivals Liverpool at the Stadio San Paolo in October. "I think Napoli were unlucky not to go through in the Champions League. They’ve proved that they’re a quality team and are second in Serie A, so they’re a tough team to play against. "From a few years back [Arsenal were beaten 2-0 in their final Champions League group game in 2013], we know that they’re a tough team to play against and it will be a difficult place to go. We have to be ready. We’ve given ourselves a great opportunity in the first leg - now it’s important to stick together and hopefully see out this quarter-final." Arsenal's disappointing defeat at Everton last weekend highlighted the team's struggles on the road. This problem is not merely confined to domestic competitions, as demonstrated by shock defeats away to BATE Borisov and Stade Rennais earlier in the knockout stages. But Ramsey believes the team will answer their critics, first by seeing out this tie. "We have won away from home this season, so we are capable of doing it. We haven’t done so of late but we’re confident that we can [put that right] towards the end of the season. There’s six games left in the Premier League and hopefully we can finish the job off and be in the top four and also get through to the semi-final." Ramsey is playing his final games in an Arsenal shirt, having agreed to join Juventus this summer upon the expiry of his contract. There is a steadily increasing possibility that his last outing for the Gunners could be the Europa League final in Baku next month, a scenario he says has not crossed his mind. "I haven’t though about that but hopefully. We’ve started this first leg well so hopefully we can finish the job and get ourselves in the hat for the next round."